The new blu-ray sets were released individually, so you still can get the new high-def version of the series right away without all the bonus swag. It's just the ultimate collector's edition which is delayed until the rings can be remanufactured. Hell yeah! I had almost given up hope. Tried to initiate the boyfriend into the Utena fold... he said it looked too dated for him and that it didn't age well. Personally, I am of the belief that the series looks much better than modern (this decade) anime, the detailed artwork and animation is sadly not something you see anymore. Background characters actually have fully drawn faces rather than consisting of hastily drawn lines like is the case now or even worse, being animated by CG. I was especially impressed when I first saw the scene of Utena walking up those stairs to the dueling area. I don't agree with criticizing art for calling it dated but I do understand why dated aspects could turn someone off. If you look at something like The Brothers Karamasov or any old literature it's undeniably dated, but it's still fantastic. However if someone doesn't enjoy it because they can't get into it then I totally understand. I think dated is definitely a loaded term, but I wish it didn't have such a negative connotation. As far as Utena being dated, I think it's definitely got some 90's anime aspects (the humor mostly) but the story and characters are timeless. I also think it uses its dated aspects very well but I'm biased by my love for the series and anime tropes in general. I personally don't think anime can be compared to literature in this specific context. Literature can feel dated in the sense that the way people talk changes each generation. That is not so much an issue of age rather than a modern-day reader having a vocabulary so different from the writer that they might as well be speaking a different language. It's like not being able to enjoy a book that's written in French or Spanish because you barely have knowledge of those languages in the first place. The 90s however weren't that long ago though and I personally felt like the humor and character interaction is not very different from more recent shoujo shows or just anime in general. But the matter here was in fact the visuals, not the dialogue or some other aspect of the show and visuals are of course something literature lacks as well. I don't think an anime can really look dated unless we're talking pre-70s, I understand that anime made today use brighter colors, making it seem like there's a sort of filter over it all the time (a good example of what I mean would be Kyoto Animation shows) and if you're used to seeing that all the time I can imagine it's a bit difficult to get into the rougher look of 90s anime. Still, like I said, the artwork itself and the animation are of much higher quality than shows coming out this season and probably any season of the last 10 years so I don't think it's fair to reject anything from that era because it looks old, if that even means anything. My example there probably was a little extreme given that there's a big difference between the 1990's and the 1890's, but I still think it can apply to a lesser extent. Even if Utena isn't dated now, one day it will be because like you said eventually the Japanese language will change or die out and who knows what visual media will look like in a hundred years. I take your point though about how referencing old literature as dated is more a case of not being able to understand it rather than a statement of its quality. I don't think it's a good idea to assume that media always improves over time and I definitely don't think this is the case with anime. I do think the word dated can refer to the distinct characteristics of a time period though and isn't necessarily negative. I also think having a preference for one period of time over another isn't wrong, though some people can definitely be close-minded. I would say Utena definitely looks dated, but this is only because the art style Utena employs isn't very common today and was more common then. 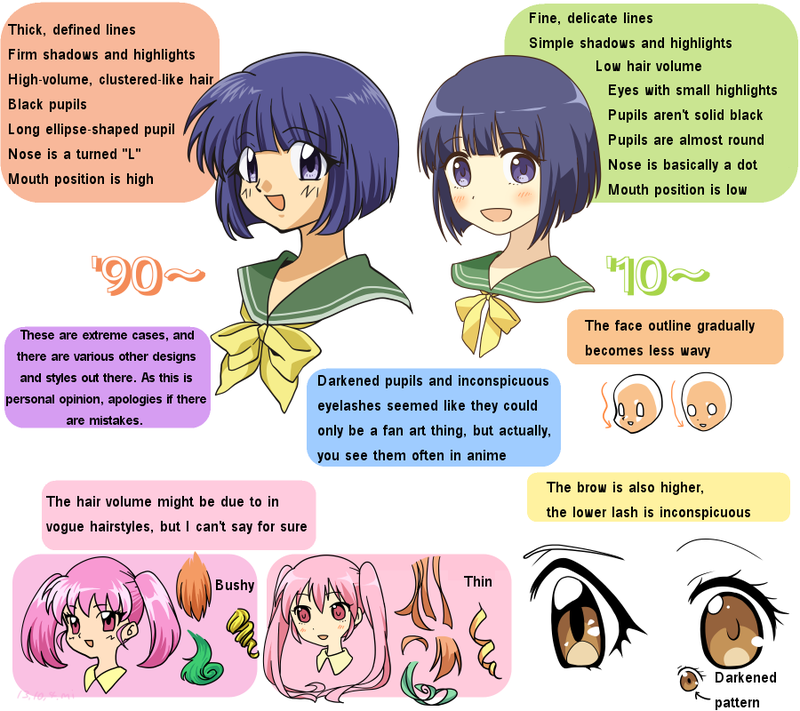 One day the current trend of how anime characters are designed will look dated as well. It's dated because you can infer its time of release from how it looks just like you could infer Brothers K is from the 1800's based on its writing style and content. Of course this method will never be completely accurate but it's impossible not to notice certain trends. I don't 100% agree with this image but I think it serves to get my point across. Of course when most people call something dated they mean it in a negative sense which I think is a lazy criticism. Instead of explaining why they dislike certain aspects (which may or may not have been common at the time of the work's release) they dismiss it offhandedly as old and therefore bad. Oftentimes people are closed off to media they see as dated without giving it a chance, but without knowing more about the boyfriend in question it's hard to say whether that's the case or whether he just has a strong preference against the 90's aesthetic and style. I guess what I'm trying to get across is that almost every piece of art will be dated given enough time and I don't see it as a bad thing. I feel like they printed that artwork, unobstructed, personally, for me. And you. My scanner is twitching, the only copies that exist are garbage scans of the Japanese DVD boxes with spam all over the images so that's basically new art IMO. Meanwhile â€¦ I'm scrutinising the reflections in the rings and that warehouse they shot it in. No cleanup whatsoever. If I did that, I would get fired from my job. Haha! Man, the book is packed. Honestly, I can't afford to atm, but I'm 99% nothing in the book I don't already have. 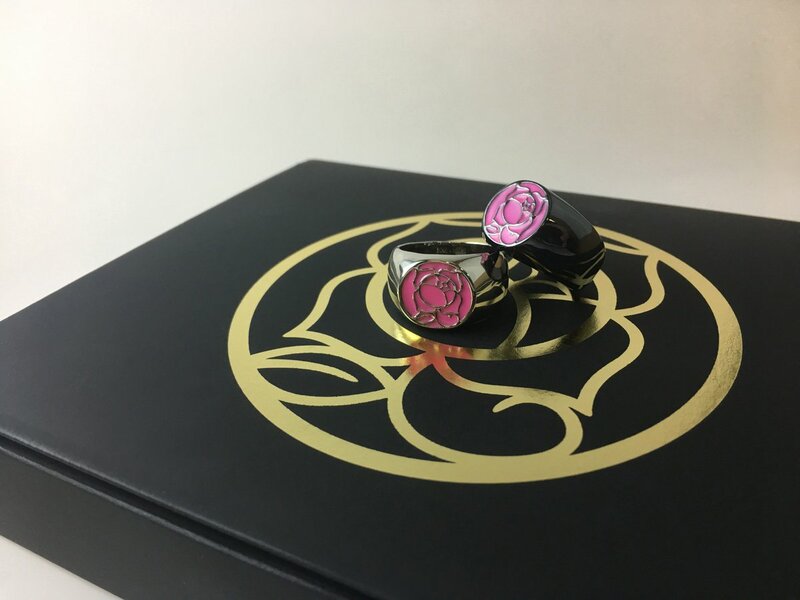 Anyone with jewelry knowledge have any idea how viable it would be to get the rings resized, and whether they would be damaged by being worn on a chain? My set came Monday and I am LOVING it. It's so beautiful. The Prince isn't the one who says "We will meet again." It's supposed to be Utena/the princess who asks "We will meet again, right?" It's correct on the blu ray Such a small thing, but it would always drive me nuts, LOL. I saw the 'Special Thanks' to Giovanna/Yasha and the Empty Movement community at the end of the first disc's credits, so THANK YOU if you were responsible for fixing that and also for your contributions to the release. That was one of the things we discussed, yes! It's a total head trip to have my name on official Utena releases, but we were a point of contact for corrections to the subtitles and changes to improve them. I got to fix my comet speech, we shifted phrasing in a lot of key places, things like that. We had this done partly through the Tumblr by engaging other fans, so about 2/3rd was us being how they were communicating with the fanbase, and 1/3rd stuff we were picking out and ironing out. So uh, most of the dialogue changes are Touga and Akio....but in our defense, they were also the harder characters to translate. You can translate Utena's dialogue with Google, ffs, she says what she means. My copy of the 20th Anniversary Ultra Edition Blu-ray set arrived in the post today - rings, book, glitter, and all. I am glad I had the opportunity to import it down under and get it during Rightstuf's 30th anniversary sale, as I doubt the Australian license holder Hanabee is going to bother doing it. Hanabee had done the DVD remaster localisation some years ago, but they have yet to bring over the standard Blu-Rays release. I'm uncertain if Utena is actually listed on their site anymore, as prior to placing my order through Rightstuf, I couldn't find it there. I feel I ought to add that one of the selling points that pushed me to order in this particular(ly dazzling) set were the details in the last few posts. Up until I saw it mentioned above, I had been unaware of that particular error in the subtitles for Utena's dialogue in the first episode, and I had been unaware that Giovanna and Yasha from IRG, and other fans from the larger community had contributed to this release. I figured that if community members had helped to improve the subtitles, that it would be worth picking up this set over the previous (and perhaps less dazzling) editions. I've loved this series since I first saw it seven years ago, and though I confess I've postponed watching it since so that I could one day own a copy of my own to watch, I am happy to own this set knowing that it is the finest version of the series (and film) available our in language due to community input. 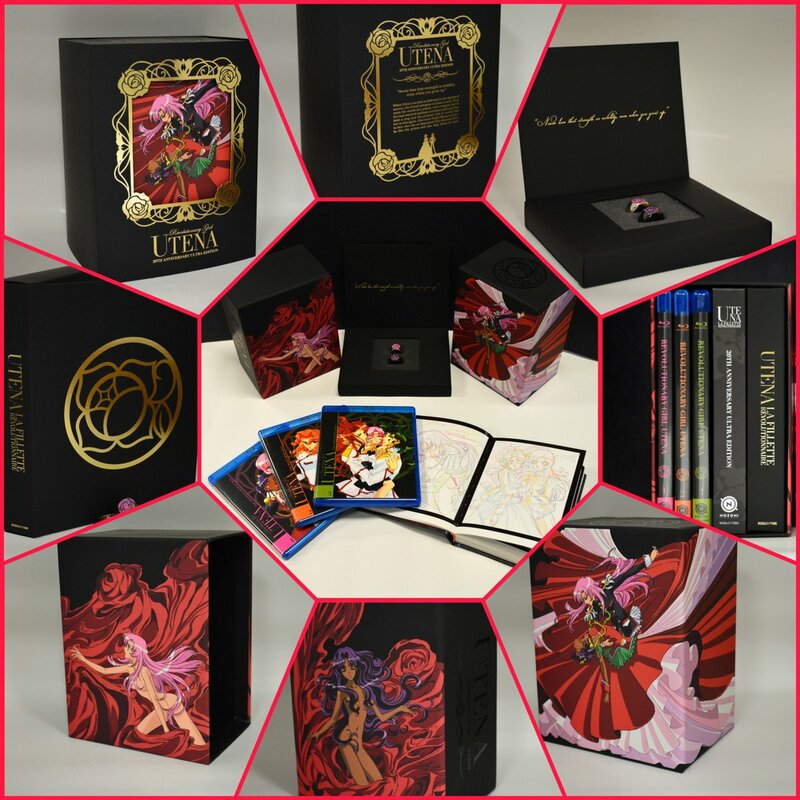 I am not so great at offering compliments, but, I am grateful for the contributions of all those involved, and I hope that this community continues to the support the legacy of Utena for many years to come.